Looking For Nautical Themed Bedroom Ideas? You’re In The Right Place! Here are some fun ideas for decorating kid’s bedrooms with a nautical theme, let me know what you think. If your child is mad for boats, sea and sailing – they may just love some of these products. This cute boat shaped bed would look great in any nautical themed kid’s bedroom. It’s a great bed for toddlers who love anything to do with boats and the sea and are just transitioning into their own ‘big boy’ (or girl) bed. This bed will make bedtime exciting for little ones as they can imagine they are sailing off to dreamland in their very own boat! The bed is low to the ground so toddlers can safely and easily climb in and out. The bed is solid and well made and even includes a storage compartment at the front for favourite toys or bedding. These adorable pirate themed peel and stick wall decals would look gorgeous in a pirate themed kid’s bedroom. They are a fun designs, colourful and friendly. They could be used in a number of creative ways on a bedroom wall; maybe as a border, to decorate a painted pirate ship or simply to brighten up one area of a bedroom. The stickers can be applied to and taken off walls quickly and easily so kids can help to decorate by choosing where to place them. They might also have fun moving the stickers around themselves to create different pirate scenes. I adore these super cute nautical themed cat cushions. They would make the perfect finishing touch to a young boy or girl’s nautical themed bedroom. The amusing cartoon style design, with a cat dressed like a Sailor and holding up two fish to his eyes comically, is a lot of fun. This would be especially suited to those kids who have a pet cat. The cushions could be used as an attractive decoration placed on the child’s bed or chair, having several of them would look particularly good. Really, matching bedding when it comes to creating a kids themed bedroom, is an essential component! This beautiful sailboat/lighthouse quilt would look perfect in a seaside themed bedroom. It features a fun and colourful print which includes sailboats, lighthouses, flags, fish and life saving rings. Made in a junior size, I have also seen some matching curtains – which would work well if you’re going for an overall theme. This pretty Lighthouse LED nightlight could make a magical edition to your nautical theme. The light it gives out is at just the right level to give little ones the reassurance they need to fall asleep at night, and to let you peek in to check that they are safe and asleep. This light also changes colour, as you can see in the image below and will create a calming atmosphere with a soft glowing light. It’s an adorable Lighthouse design that would add the finishing touch to any kid’s nautically themed bedroom. You also don’t need to worry about wires or plugs, as this little light takes batteries. This gorgeous personalised nautical name sign is a really eye catching piece of decor. It is made from wood and rope and would look really stunning as a centrepiece on a bedroom wall in a nautical themed bedroom. The sign features a children’s name as well as a nautical graphic (a seahorse, an anchor or a starfish). It can also be personalised in various colours to fit the theme of a bedroom. These modern art whale wall decals are so much fun! Applying lots of them would add loads of personality and colour to any wall in a kid’s seaside themed bedroom. They come in a whole range of colours so can be matched to any colour room, making them great for boy or girl’s rooms. Simply let the seller know which colours you’d like at the time of ordering. You can also get a personalized name decal, which will add an individual touch. Wall decals are easy to apply and remove making them easier, quicker and cheaper to use than wallpaper and perfect for freshening up a plain bedroom wall! These decorative fishing nets are a unique way to add an authentic touch to a kid’s nautical themed bedroom. The nets are made from thin rope and include shells for decoration. For a more interesting sea theme, you could easily add other seaside themed items to the netting, such as life buoys, starfish or anchors. These fishing nets can be hung from the ceiling or walls of a child’s room to make them feel like they really are on a fishing boat at sail at sea! This practical laundry basket features a modern blue and white design with an Anchor image printed on the front. As well as a laundry basket, it may be used to store other items such as toys or bedding, (as you can see pictured below!). This is a relatively small laundry basket, making it a great size for kid’s bedrooms. As well as being decorative, they have the added benefit of encouraging children to pick up their clothes for washing! Who wouldn’t love a few strings of these pretty sea shell fairy lights twinkling away in their seaside themed bedroom every night? These cute little sea shell fairy lights would look brilliant when lit up at night in a kid’s bedroom. They could be hung around a bed head, across shelving, around a mirror or for an authentic touch, entwined in fishing netting. These are a perfect accessory in a girl’s bedroom with a mermaid or beach theme. That about concludes my post today on Nautical themed bedroom ideas for kids! Have I missed anything out? Leave me a comment below. Are you thinking of creating a nautical themed room and what sort of products are you looking for? Other posts that may interest you…. This post was written by Guest Writer, Annette. 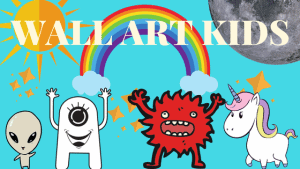 Don’t forget to follow Wallartkids on PINTEREST!